According to an independent study from research firm Vanson Bourne, most businesses have a long way to go before they are able to respond to market or customer changes quickly enough to be competitive. Unfortunately for businesses, there's often a disconnect between business objectives and what information technology can deliver. 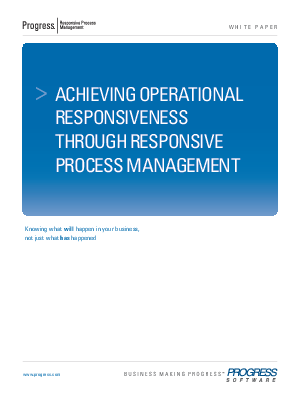 This whitepaper will demonstrate how Progress Software can empower your company to respond to changing conditions and business events as they occur, enabling business leaders to capitalize on commercial opportunities, drive greater efficiencies in their organizations, and reduce risk.